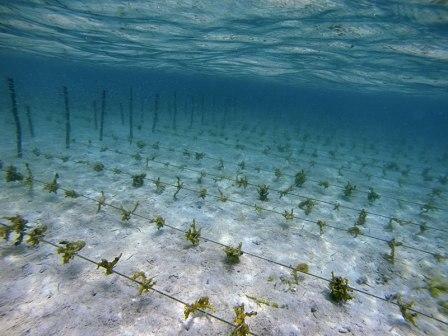 Water quality is one of the vital elements of a thriving, healthy reef. It also affects human health either directly or indirectly. MES conducts sea sampling around member resort properties twice a year in May and November representing summer and winter seasons in Fiji. The four constituents tested on seawater results are faecal coliform (FC) bacteria, salinity and nutrients- phosphates (P) and nitrates (N). The results are compared with the Australian and New Zealand Environment Conservation Council (ANZEEC 2002) Seawater Standards and guidelines ensuring that the levels nutrients do not affect coral growth and faecal coliform level do not affect public health and seawater is safe for primary and secondary recreational activities. The acceptable level of nitrates and phosphate that will not cause eutrophication (excessive growth of algae) is 0.01-0.06 mg/L and 0.001-0.010 mg/L respectively. The acceptable level of faecal coliform bacteria is less than 1 FC/ 100 ml. MES conducted its last sea water sampling around its member resorts during the outgoing morning tide on the 29th of November. Despite the scattered locations of each sampling site, MES staff conducted the sampling exercise with the assistance of member resort and marine staff that provided support and boat transfer to the next sampling site. All the well preserved samples were under four degrees of ice during transportation. We visited a total of twelve sampling sites with twenty-four samples taken per site. They were later transported to Suva for analysis at the Water Authority of Fiji laboratory. Reports will be presented to each resort management once the results are revealed with recommendations for better waste management practices in supporting healthy biodiversity and public health. MES would like to thank all its Cooperate Sponsors and member resorts in supporting the seawater monitoring program.